TribePad is a modern, web-based applicant tracking system delivering out-of-the-box functionality for numerous companies and organizations around the world. It was designed with the idea to assist companies to understand the role of technology in their hiring process, and to help them improve their employment strategy and engagement. Thanks to it, many businesses witnessed positive trends when exploring their talent pools, and managed to make the most from their most important productivity factor – the human one. Available worldwide, and supported on various devices, TribePad allows users to access information in literally every situation, and organizes the employment process with minimal management interference. The same system could be used for smart analysis, and revealing both perils and positive trends in the company’s workflow. On top of that, TribePad is priced on quote basis, which means companies are not supposed to pay for features they are not going to use, but rather get a price for what they genuinely need. The open APIs allow integration with various carrier websites, which is only one of the benefits delivered by the product’s Vacancy Marketing feature suite. The same APIs will help you start running your TribePad seamlessly, as if it was always a part of your software infrastructure. TribePad delivers all functionality you would expect from an up-to-date social application tracking system, and much more. There are a variety of reasons why you should consider it for your company and business, with pricing and powerful integration capacity being only few of them. What is absolutely distinguishing this program from similar applicant trackers is the advanced feature suite you receive, and where you get to do much more than simply managing talent. Among them, you will find vacancy management capabilities, social analytics, recruiting, security & infrastructure, and even brand support. For any of them you can contact the company and arrange a free and private demo. Once you’ve explored the features and made a list of what your business needs, they will round up a package on the best price able to meet your budget. In terms of recruitment features, you can expect TribePad to allow you to run multimedia candidate profiles, organize and conduct video interviews with them, and test their abilities without having to use an additional system. At the same time, you will get both automatic and manual talent pooling, taking away some of recruiters’ most difficult burden – deciding who is the best candidate for the position. The system takes in consideration criteria you could easily neglect, and searches the profile in detail. The very same system uses ATS integration to various SEO led career websites, categorizes applicants in groups, and maintains a large knowledge base for easier onboarding. TribePad complies with OFCCP, and responds to highest security standard to protect your information, and the personal data of your candidates and employees. It is very customizable, and allows you to personalize it and make it more brand-centered when hiring your newcomers. As we already mentioned, this system can even perform social analytics, as it consolidates data in a calculable way, and makes use of it to improve your HR and business decisions. If you are considering TribePad it might also be beneficial to analyze other subcategories of Best HR Software listed in our base of SaaS software reviews. Since each company has unique business requirements, it is sensible for them to refrain from seeking a one-size-fits-all perfect software system. Needless to say, it would be futile to try to find such a platform even among popular software solutions. The intelligent thing to do would be to list the various important factors that require consideration such as main features, finances, skill levels of workers, company size etc. Then, you should do your research thoroughly. Read some TribePad reviews and investigate each of the other solutions in your shortlist in detail. Such exhaustive groundwork can make certain you reject ill-fitting systems and select the app that provides all the features you require for business success. How Much Does TribePad Cost? We realize that when you make a decision to buy HR Software it’s important not only to see how experts evaluate it in their reviews, but also to find out if the real people and companies that buy it are actually satisfied with the product. That’s why we’ve created our behavior-based Customer Satisfaction Algorithm™ that gathers customer reviews, comments and TribePad reviews across a wide range of social media sites. The data is then presented in an easy to digest form showing how many people had positive and negative experience with TribePad. With that information at hand you should be equipped to make an informed buying decision that you won’t regret. What are TribePad pricing details? What integrations are available for TribePad? A system that has gone from strength to strength and seen an amazing amount of development of its features in such a short period of time. Innovative training material using You Tube and Video interviews. A great enhanced CV Search functionality made finding suitable candidates for jobs easier and job alerts certainly helped reduce the number of queries into the team. The team also took on feedback from both front end and back end users to help improve both the candidate and recruiters experience and the development team are always open to ideas. If you give them an idea of what you want to achieve they will work with you to develop this. A refreshingly outgoing innovative team to work with. 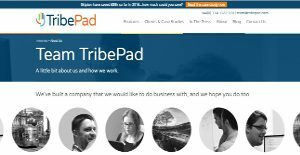 If you need more information about TribePad or you simply have a question let us know what you need and we’ll forward your request directly to the vendor.